"I think these dreams are the future." 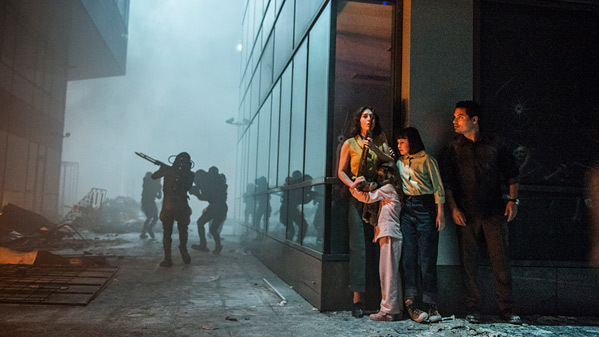 Netflix has debuted the first official trailer for a sci-fi action thriller titled Extinction, the latest film from Australian filmmaker Ben Young (Hounds of Love). This feature story involves an alien invasion that arrives after a father starts having nightmares predicting their attack. He learns more about himself as he takes his family and tries to survive. Michael Peña stars in this, along with Lizzy Caplan, Mike Colter, Israel Broussard, Emma Booth, Tom Riley, Lilly Aspell, Erica Tremblay, and Amelia Crouch. This looks crazy cool, holy hell, where did it come from? Netflix loves to surprise us with something big out of nowhere. I'm digging the visuals in this, but I'm not sure if the story is trying too much at once. We'll find out very soon - the film is available at the end of the month. Check it out. A working class father (Peña) of the future faces recurring dreams of destruction by an unknown force. When his unwanted nightmares begin to affect his relationship with his family, he soon realizes they may be the key to a horrible reality, as a relentless alien attack begins to destroy the Earth. As the invaders’ assault progresses, he is forced to find both the strength to protect his family and an understanding of who he truly is. 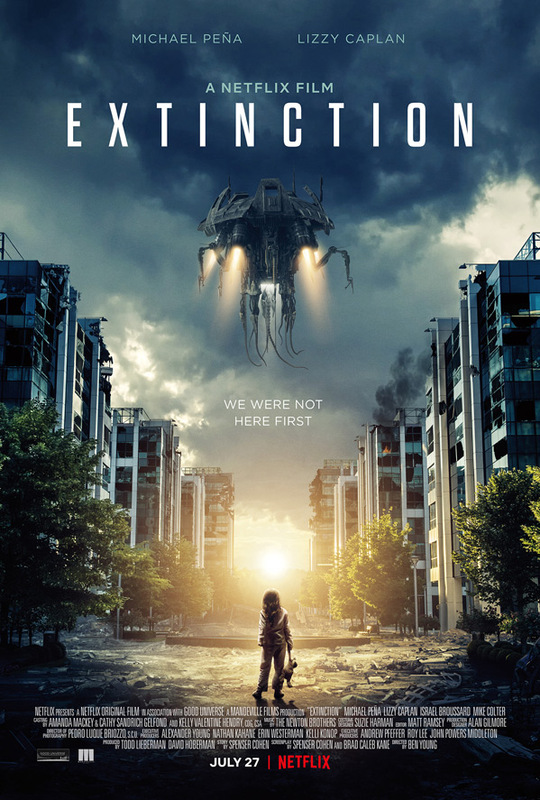 Extinction is directed by Australian filmmaker Ben Young, of the acclaimed film Hounds of Love previously. The screenplay is written by Spenser Cohen. Netflix will premiere Ben Young's Extinction streaming exclusively starting on July 27th later this month. First impression? Who wants to watch this?